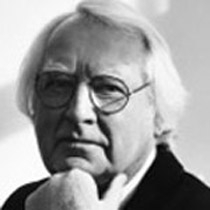 Richard Meier is well known and respected around the world for his architecture and designs. He has been awarded major commissions in the United States and Europe, including courthouses, city halls, museums, corporate headquarters, and housing and private residences. 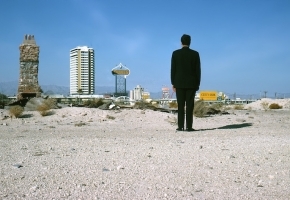 Some of his best-known projects include the Getty Center in Los Angeles, the High Museum in Atlanta, the Frankfurt Museum for Decorative Arts in Germany, the Canal Plus Television Headquarters in Paris, the Barcelona Museum of Contemporary Art, the Hartford Seminary in Connecticut, and the Atheneum in New Harmony, Indiana. Recognized with the highest honors available in architecture, in 1997 he received the AIA Gold Medal from the American Institute of Architects as well as the Praemium Imperiale from the Japanese government in recognition of a lifetime achievement in the arts. In 1995 he was selected as a Fellow of the American Academy of Arts and Sciences. He received the Deutscher Architekturpreis in 1993 and in 1992 the French government awarded him with the honor of Officier de l’Ordre des Arts et des Lettres. In 1989 the Royal Institute of British Architects, of which Meier is a Fellow, awarded him the Royal Gold Medal. 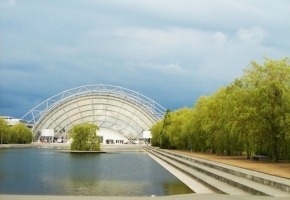 In 1984, Meier was awarded the Pritzker Architecture Prize, considered the field’s highest honor. He was the youngest recipient of this award in the history of the prize. That same year, Meier was selected as architect for the prestigious commission to design the $1 billion Getty Center in Los Angeles, California. Since receiving his architectural education at Cornell University, Meier has been awarded honorary degrees from the University of Naples, New Jersey Institute of Technology, the New School for Social Research, Pratt Institute, and the University of Bucharest. Meier has given numerous lectures throughout the world and participated in many juries. He has written and been the subject of many books and monographs and innumerable newspaper and magazine articles. In addition to being on the Board of Directors of the Cooper-Hewitt National Design Museum and the American Academy in Rome, he is also a Fellow of the French and Belgian Academies of Architecture, and a member of the Bund Deutscher Architekten and the American Academy of Arts and Letters, from which he received the Brunner Prize for Architecture in 1976. Meier has taught at Cooper Union, Princeton University, Pratt Institute, Harvard University, Yale University, and UCLA. He currently holds the Frank T. Rhodes Class of 1956 University Professorship at Cornell University. He is a Fellow of the American Institute of Architects and received a Medal of Honor from the New York Chapter in 1980 and the Gold Medal from the Los Angeles Chapter in 1998. His numerous design awards include 29 National AIA Honor Awards and 53 Regional AIA Design Awards.